Ulrich Zwingli, reformer of Zurich, died in the battle of Cappel, carrying the banner for Zurich's forces. A man of great originality--his reforms began a year before Luther's--he seemed irreplaceable. 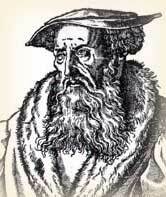 But on this day, December 23, 1531, Heinrich Bullinger took over the vacant pulpit of Zurich. A contemporary of Calvin, he is remembered as a notable reformer in his own right, a kindly man who did not allow small doctrinal differences to separate him from other reformers. 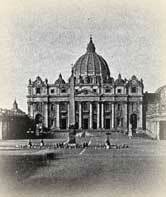 Like others of that generation, Bullinger's training was in the Church of Rome. Born in Bremgarten, Switzerland, he studied in a local monastic school before moving on to the University of Cologne. Wishing to compare the teaching of the Roman Church with that of Luther, he read Luther and Melanchthon. His investigation broadened out to include thinkers of the early and medieval church. He came to the conclusion that doctrine must be derived from scripture. 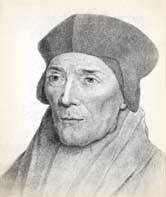 He became a Lutheran, but later preferred the doctrines of Zwingli. 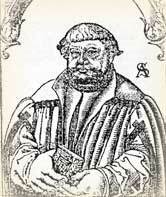 In 1529, he married Anna Adlischweiler, a former nun. This step was not hard for him. His father, also a Church of Rome priest, had set the example by paying his bishop a yearly fee for permission to maintain a wife. Bullinger later convinced his father to leave the Roman Church and the elder Bullinger immediately married the woman with whom he had faithfully lived for so many years. Bullinger's married life was happy. Warmhearted, he delighted in his children and grandchildren. Some men drive their children to rebellion. All of Bullinger's sons became Protestant ministers. His hospitality to refugees from Queen Mary's England (on a tiny salary), made him influential with the Church of England when it was reestablished. The Thirty-nine Articles of the Church of England show his influence. His Decades, a book of sermons on key doctrines, was reprinted 79 times in England within a single century. The Puritans took him as their guide. Bullinger was a key player in drafting the two Helvetic Confessions that unified Switzerland's faith. (Helvetia was the Latin name for Switzerland.) The second confession, in fact, was originally drawn up as his own personal statement of faith, but became the most broadly accepted reformed confession, agreed to by reformed movements in half a dozen nations. A typical statement from the Second Helvetic Confession is direct and clear. "Christ Is True God. We further believe and teach that the Son of God, our Lord Jesus Christ, was predestinated or foreordained from eternity by the Father to be the Savior of the world. And we believe that he was born, not only when he assumed flesh of the Virgin Mary, and not only before the foundation of the world was laid, but by the Father before all eternity in an inexpressible manner. For Isaiah said: 'Who can tell his generation?' (Ch. 53:8). And Micah says: 'His origin is from of old, from ancient days' (Micah 4:2). And John said in the Gospel 'In the beginning was the Word, and the Word was with God, and the Word was God,' etc. (Ch. 1:1). 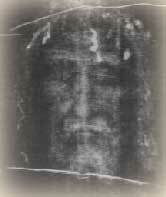 Therefore, with respect to his divinity the Son is coequal and consubstantial with the Father; true God (Phil 2:11), not only in name or by adoption or by any merit, but in substance and nature, as the apostle John has often said: 'This is the true God and eternal life' (1 John 5:20)..."
Some denominations, such as the Puritans of New England, emphasize covenant theology. Bullinger was the first reformer to write an important work on the subject. He argued that both Jews and Gentiles participate in the same Abrahamic covenant by faith. As surprising as it may sound, Bullinger wrote more than Luther and Calvin combined. "Bullinger, Heinrich." The Oxford Dictionary of the Christian Church. Edited by F. L. Cross and E. A. Livingstone. Oxford, 1997. "Bullinger, Heinrich." New Schaff-Herzog Encyclopedia of Religious Knowledge. Grand Rapids: Baker Book House, 1954. Zwingli and Bullinger; selected translations with introductions and notes by G. W. Bromiley. London: S C M Press, 1953.